I must admit, I have committed the unspeakable offense of packing up jewelry in plastic ziplock bags when traveling. I wrapped each piece by itself in soft tissue paper and placed them in sandwhich ziplock bags before placing them in a bigger ziplock bag (talk about protection!) but still, this crime is unforgivable especially since there are now lots of cute & inexpensive travel case options. Today we are counting down 5 ways to care for your jewelry when traveling and also providing a variety of travel cases to choose from. 5. Do not keep your jewelry in your checked luggage. Always have your pieces in your carry on or purse. This way you always have an eye on them and guard against theft. 4. It is advisable to store your rings in cases with dedicated ring holders. This prevents them from rubbing against each other therefore causing scratches on the surface or breaking off a piece of the ring. 3. Be sure to keep diamond jewelry, gemstones, pearls and gold or silver pieces separated from each other to prevent scratching. If you have silver, throw in a pack of silica gel or anti-tarnish strips to prevent them from darkening while on the trip. 2. Never store pearls with other jewelry and always store them in a soft breathable pouch. No plastic storage. 1. Store your jewelry in a travel case but don’t overcrowd it. This disorganized system can result in you misplacing or losing pieces that may fall unnoticed from the case. Furthermore, forcing jewelry into your travel case could cause damage, such as bending a fragile piece, or chipping a fragile stone. 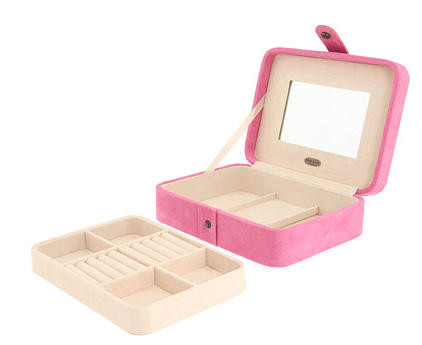 Do you use a jewelry travel case while traveling? What jewelry care sin have you committed lately? Lets hear your voice!